OK, ok, ok, great your ready to run some facebook / Instagram ads But there is one issue you are facing. How do I pick the correct Objective? Well in this article I break down one of the first steps to creating a Facebook /Instagram ad. 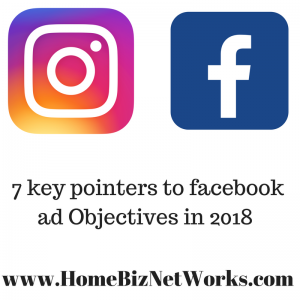 Below is my 7 key pointers to facebook ad Objectives in 2018. Firstly-lets start with the 7 facebook /Instagram objectives. So what does this all mean. Well depending on your campaign and the goals of your Instagram / facebook ads, you will need to pick one from the above. One main pointer when building out ads, is to be specific, truth full, and tell the viewer what they will get if they follow the links / instructions in your ad. Traffic – Link clicks, this objective all comes down to clicks on your ad copy link. This objective is perfect if you are trying to build out a email list, and if you are trying to more views to a specific website. App-Installs – this is regarding mobile and cell phone use. Use this objective if you have a service where the user / customers need to install a specific app or software. Engagement – For posts only. You see facebook / Instagram loves it when users on their platforms engage with posts. And facebook . Instagram will reward you in regards. The goal is to get people talking and staying on their platforms. When this is done correctly, you see a huge boost in your sales, and page growth. Conversions – you will want to run this add when you are looking for conversions on your website. This ad objective is great when you are trying to sell physical products like jewelry / coffee mugs. use keywords with in your title, adcopy and ad content, that relates to your sales pages and offers.